[*]Magic KeyboardLike with the 4K iMacs, customers can swap out the included Magic Mouse 2 for a Magic Trackpad 2 for an extra $50, or choose to receive both for an additional $129. Gudi, martyjmclean, glowplug and 4 others like this. cosmos, pratikindia, iModFrenzy and 9 others like this. pratikindia, iapplelove, KeithBN and 4 others like this. If I were to ever have them make the switch I’m guessing the best bet would be a 2018 Mac Mini. This seems like the best bang for the buck. Longevity would probably be the most important factor, because they’d probably want the computer to last a decade (or maybe even be their last computer as they are in their 70’s). dms_91, Oldmanmac and house13um like this. Oldmanmac, pratikindia, JWD and 6 others like this. I've been debating between a new maxed out 8-core i9 iMac w/ 128gb OWC ram and a refurb 10-core iMac Pro w/ 64 gb ram. I am leaning pretty heavily toward the iMac Pro right now. The new iMac definitely gives you more bang for your buck, but I have a feeling the iMac Pro will be a more robust machine in the long run (and I need the machine to last at least 5 years, hopefully more). Icaras, HJM.NL and MrBat like this. Thanks for the well written summary. Have you, or would you, do a comparison between going with the Mini versus the iMac? It's time for a lot of us to upgrade my iMac, and the latest iMac leaves out some great things like the T2, default SSD, etc., so it's intriguing to think about going with the Mini. especially with Apple promising new monitors when the Pro comes out this year. Other than the obvious of having to get a monitor, it would be great to see a well written pros and cons of the Mini vs iMac. Thanks for considering it. I thought thunderbolt3 was plenty fast enough for the fastest SSD? Am I misinformed? Can’t believe they still sell non-Retina and HDD Macs as entry-level models. And for no less than 1K. Shameful. All I will say is upgrade to the i9. It is the i9-9900k which is an amazing processor. The price is not bad. The iMac with that processor is only about a $500 premium over me building my own similarly speced machine. JWD and KeithBN like this. pratikindia, J.J. Sefton and Huck like this. Other con is no 8 core option. For iMac major con is it only has 2 thunderbolt ports. My late 2014 iMac had a 3TB fusion drive, and it's too small. Nearly 5 years later that's the biggest option? LOL! Why not a 4-8TB fusion drive or at least a 4TB SSD for a couple hundred more (which would still increase their profit)? This is why I haven't bought another iMac. The 4 core 4Ghz i7 still isn't all that much slower than these new models. Given their awful options, they should allow a No ram, No SSD (of free 128GB SSD) option. I guess I'll be waiting until an external 4TB SSD (with comparable speeds to Apple internal SSD) is affordable, and that will be a long time, before I configure a buy a new one. The iMac "Pro" is ridiculous at this time and should be removed from the lineup until it can start with 10+ core i9s and 4TB SSD at a minimum. It's a massive machine, so why do there continue to be so few ports? Apple isn't interested in their computer business and should probably sell it and the OS off at this point. orbital~debris and jeremiah256 like this. The one with the super-thin bezels all the way arou... Oh, that’s right! SMH. I had drawn up a proposal to outfit our college media labs with iMac Pros -- until the new iMacs appeared. I was able to configure a 27" iMac with specs pretty close to an iMac Pro, but for half the price. So that's what I went with and saved about $60,000. I wonder if Apple will quietly retire the iMac Pro when the new Mac Pro finally appears. I used to always be the Mac guy recommending macs to my relatives and friends, and got quite a few into them. Especially iMacs, MBAs and MBPs. Until 2016 of course. While I will probably purchase an iMac with an SSD and unhappily pay the price, I cannot in good conscience recommend macs to my friends anymore, once you upgrade to decent specification. The price is too high, and I value my friendships. My late 2014 iMac had a 3TB fusion drive, and it's too small. Nearly 5 years later that's the biggest option? LOL! I just ordered an Early 2019 iMac, also with a 3TB Fusion Drive. My only regret was that I couldn’t order a larger Fusion Drive. Why not a 4-8TB fusion drive or at least a 4TB SSD for a couple hundred more (which would still increase their profit)? “A 4TB SSD for a couple hundred more”? As you would say: LOL! Apple’s difference in price between a 4TB SSD and a 3TB Fusion Drive is US $2,800! Some of that is probably markup, but certainly not all. If you think the difference in Apple’s cost between a 128GB SSD + 3TB HD on the one hand and a 4TB SSD on the other is only US $200, then you’re dreaming! Update: I just priced SSD upgrades for the 2017 iMacs from Other World Computing. They charge from US $300 to US $450 for a bare 2TB SSD (depending on model), so yes, Apple’s US $1,000 markup for the 2TB SSD is steep. But the cost of even a 2TB SSD would seem to be more than US $200, so the cost of a 4TB SSD (which Other World Computing don’t even offer) would be far more. Right, because folk who can’t afford the extra US $800 to upgrade from the 1TB HD to a 1TB SSD don’t deserve to buy a Mac! How much more elitist can you get? Update: Since posting the above, I went to Other World Computing to price their SSD upgrades for 21.5-inch iMacs. They offer bare 1TB SSDs for as little as US $129. (Their better 1TB model is US $259.) I have no idea what the reliability of that US $129 model is, but it would certainly seem that Apple’s US $800 markup is excessive, and that there is indeed a strong case to be made for replacing the 1TB 5400 rpm HD in the base 21.5-inch iMac with a 1TB SSD, even if it required raising its price by, say, US $100. My apologies for my outburst, which was based on my ignorance of how much the prices of small SSDs have dropped! Update 2: Since writing the above, I’ve done some more research. Those inexpensive SSDs from Other World Computing are SATA 3, which at a theoretical maximum throughput of only 600 MB/s are much slower than the more costly NVMe SSDs in Apple’s newer iMacs. 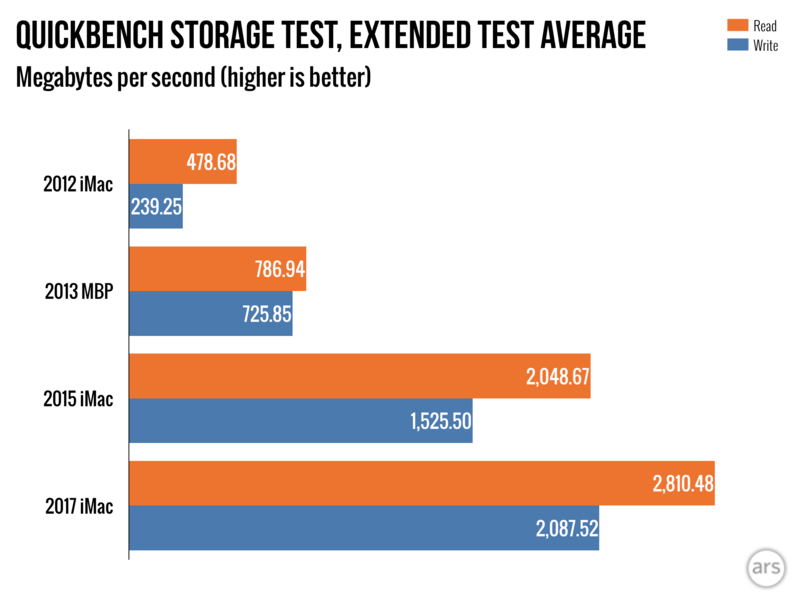 See this article at Ars Technica and scroll down to the section, “SSDs: Getting the most from PCI Express.” Note especially the difference in read speeds in this chart between the SATA 3 SSD in the 2012 iMac and the NVMe/PCIe 3.0 SSD in the 2017 iMac. That’s almost a sixfold difference in read speed! That is what accounts for at least some portion of Apple’s high SSD prices. A 1TB NVMe/PCIe 3.0 SSD would likely raise the cost of the entry-level iMac by more than the US $100 I suggested above. Icaras and R3k like this. What a shame of still including spinning hard drives as a default configuration.